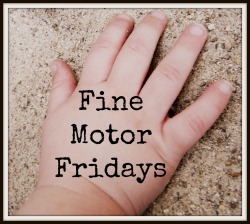 Happy Fine Motor Friday! My co-hosts (Lalymom, Craftulate, School Time Snippets, Little Bins for Little Hands, P is for Preschooler, Racheous, Still Playing School, House of Burke and Powerful Mothering) and I are excited to share fun activities for toddlers and preschoolers that help build fine motor skills every Friday. At the end of this post you will find links for more great fine motor activities from my co-hosts. Be sure to check them out! To celebrate Earth Day I put together a small unit about recycling. One of the activities that I set up was this Recycle sorting fine motor game. I found these miniature recycle bins at the Dollar Tree a couple of months ago and knew they would be the perfect addition to our recycling unit for fun and games. To set up this fine motor activity I placed the two recycling bins on a tray along with a small container filled with blue and green foam counters, and a pair of grabbers similar to these. Ours are the cheap kind from a bug kit. This game can be played all kinds of ways and can be used to practice a number of skills. My initial plan was to have Caden sort the counters by color, which he did some of the time he played. Mostly he just practiced his fine motor skills and grabbed the counters and put them in either of the recycling bins. But this game would also be great for counting. Caden also enjoyed lining up and stacking up the small foam blocks which is another fun way to practice fine motor skills. I used this moment for a mini geometry lesson and told him the proper name for a block is cube, to which he replied “no, it’s a block”. And no recycle play would be complete without a recycling truck. We love this recycling truck from Green Toys which is actually made from recycled milk jugs. What a fun activity!!! I love the little recycle bins and that he figured out to put the cubes in the recycle truck also! I also love that the colors were so Earth Day friendly! So cute!!! Pinned! LOL at the “No, it’s a block.” I said something about a circle once and my daughter said, “No, that’s a sphere!” Okay, random anecdote. But I love this activity – and how cool that the truck is actually made of recycled material! So fun! My son is in full fledged “vehicles are awesome” mode and I am always looking for ways to engage him! This is great! Ha! I love that your son corrected you ; ) Cute! Great activity!